Pictured L-R: (L-R) Scott Jacoby, Phil Nicolo, Glenn Lorbecki, Eric Boulanger, Mike Clink (Steering Committee Co-Chair), Bob Ludwig, Maureen Droney (Managing Director P&E Wing), Carlos Alvarez, Ann Mincieli, and Chuck Ainlay (Steering Committee Co-Chair). Not pictured: Harvey Mason Jr. Photo courtesy of The Recording Academy®. © 2014. 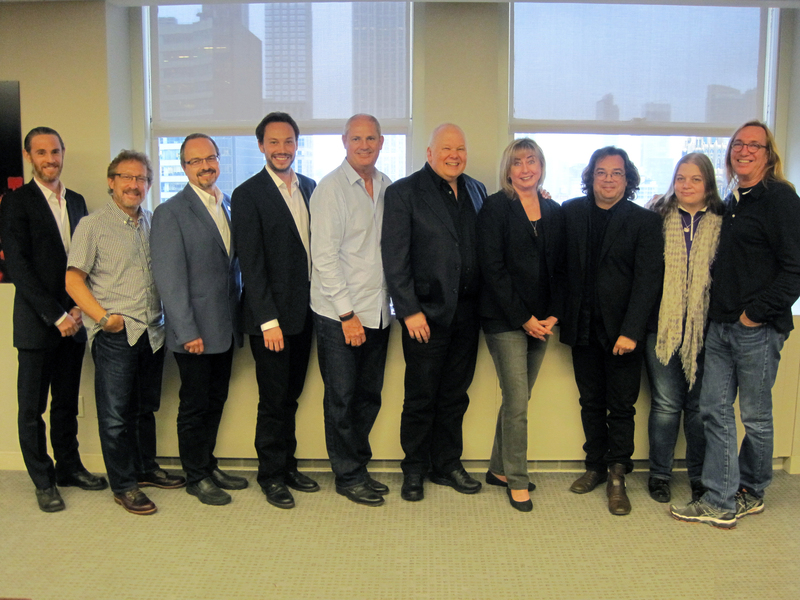 Santa Monica, Calif. (December 29, 2014) — The Recording Academy® Producers & Engineers Wing® has announced its 2014-2015 Steering Committee, the leadership group of the P&E Wing, which researches and recommends solutions for technical, creative and economic issues facing today's music production professionals. The newly seated Committee, consisting of a diverse array of music engineers, producers and audio professionals, will build upon the significant legacy established by prior Steering Committees and work to identify and evaluate key issues confronting music production professionals, with the goal of finding meaningful solutions and suggestions for the industry moving forward. The P&E Wing 2014–2015 Steering Committee includes the following music industry professionals: Chuck Ainlay, Carlos Alvarez, Eric Boulanger, Mike Clink, Scott Jacoby, Glenn Lorbecki, Bob Ludwig, Harvey Mason Jr., Ann Mincieli and Phil Nicolo. Mike Clink and Chuck Ainlay will retain their positions as Co-Chairs, leading the committee as the P&E Wing continues to advocate for excellence in sound recording, audio technologies, education in the recording arts, and the rights of music creators overall. "The role of the Steering Committee is to set our agenda for each year by identifying and prioritizing the initiatives that matter most to our members," states Maureen Droney, Managing Director of the P&E Wing. "With this group of accomplished individuals we have a collective that encompasses the wide-ranging experience and diverse perspectives that will help us address those initiatives within the changing landscape of the recording industry." Photo Caption: Pictured L-R: (L-R) Scott Jacoby, Phil Nicolo, Glenn Lorbecki, Eric Boulanger, Mike Clink (Steering Committee Co-Chair), Bob Ludwig, Maureen Droney (Managing Director P&E Wing), Carlos Alvarez, Ann Mincieli, and Chuck Ainlay (Steering Committee Co-Chair). Not pictured: Harvey Mason Jr. Photo courtesy of The Recording Academy®. © 2014.